The Art of Investigative Interviewing, Third Edition can be used by anyone who is involved in investigative interviewing. It is a perfect combination of real, practical, and effective techniques, procedures, and actual cases. Learn key elements of investigative interviewing, such as human psychology, proper interview preparation, tactical concepts, controlling the interview environment, and evaluating the evidence obtained from the interview. Inge Sebyan Black updated the well-respected work of Charles L. Yeschke to provide everything an interviewer needs to know in order to conduct successful interviews professionally, with integrity, and within the law. This book covers the myriad factors of an interview — including issues of evidence, rapport, deception, authority, and setting — clearly and effectively. It also includes a chapter on personnel issues and internal theft controls. Investigators and security professionals; law enforcement officers, private investigators, psychologists, psychiatrists, social workers, and students in criminal justice. 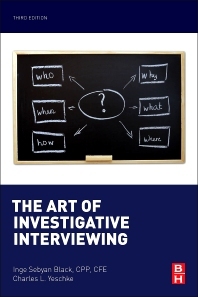 Chapter 1: So You Want to Be an Investigative Interviewer? Inge Sebyan Black, CPP, CFE, CPOI, is the president of Security Investigations Consulting. She has spent over 35 years in corporate security management, licensed as a private investigator in both the United States and Canada, and serves as a security, risk, and investigations consultant. As a Certified Fraud Examiner, she has handled cases both in the private sector and for Fortune 500 companies. Inge has successfully obtained hundreds of confessions for prosecution, and she also uses her interviewing skills when conducting security threat and risk assessments.